A very simple painting, that didn’t take very long. This is a redux of my husband’s print, “Nomeda“, as requested by a client who, like me, has always loved the original image. I really enjoy using water-miscible oils, even when I don’t use water as a medium. An expert oil-painter and dear friend of mine tested them, and actually couldn’t tell any difference when they are paired with the linseed oil that’s supposed to go with the paints. They dry faster than conventional oils, and are ridiculously easy to clean, using just soap and water, without any need to soak in turpentine. If you are new to them, I suggest investing in a relatively affordable yet useful colour, such as alizarin crimson. If you are brave, go for the gorgeous cobalt blue. 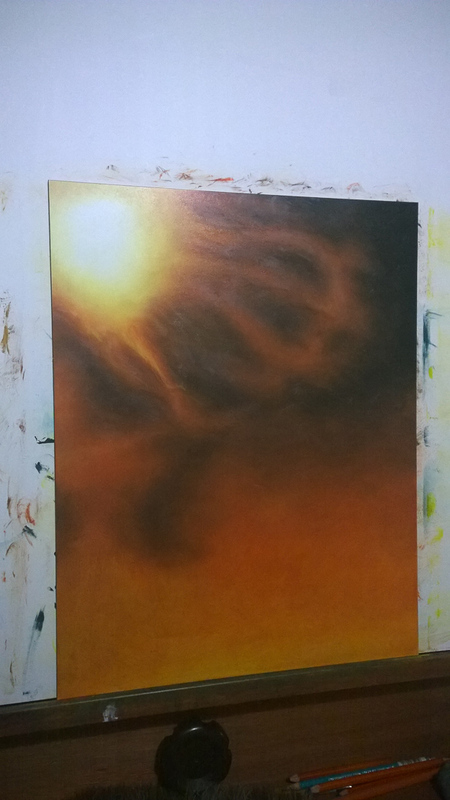 I began the painting by laying on a thin veneer of cadmium yellow, fading up to white in the upper left corner. I forgot to take a photo of this, but it’s mainly to establish a “glow”. After that yellow layer has dried, I very quickly established form with a large brush and every colour as listed above. I’m very grateful to have learned from a friend to mix colours with the brush on the go, rather than pre-mixing colours with a palette knife. This way the colours are more translucent, much more alive. I left the centre of the sun untouched, allowing the white of the canvas to do its work. In this insance, I worked in a light-to-dark progression. I then laid the painting out in the sun to cure. 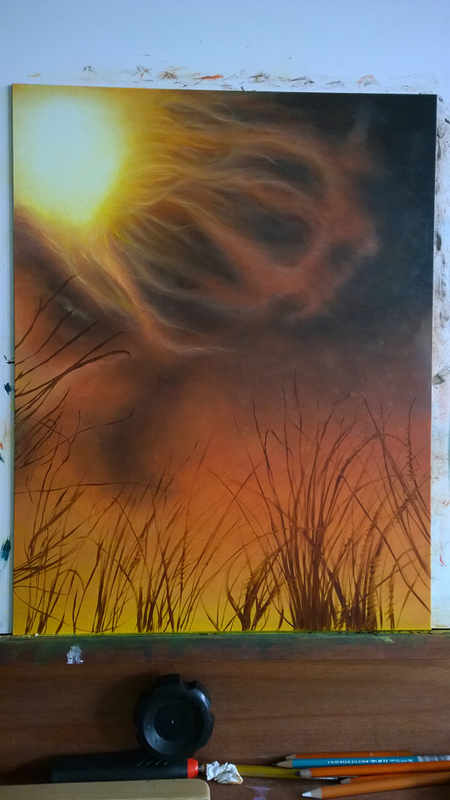 Using a finer brush, I started on finer detailing of the sun’s flares. It was a matter of balancing dark-darks and cadmium yellow, laying them against each other to create high, high contrast. At the same time, the overall darks of the painting were deepened. More curing out in the sun. I was somewhat frustrated with the sun at this point, as I felt it wasn’t bright enough in certain areas. I decided to let it sit and think about what to do with that later. In the meantime, I added the reeds, using a mixture of burnt sienna and black, and a fine, round kollinsky brush. The reeds were very wet, using a lot of oil so that could easily glide on from the brush. Before letting the painting dry again out in the sun, I took the tip of a soft brush and swished it back and forth against some of the reeds, to convey that they are reflections. 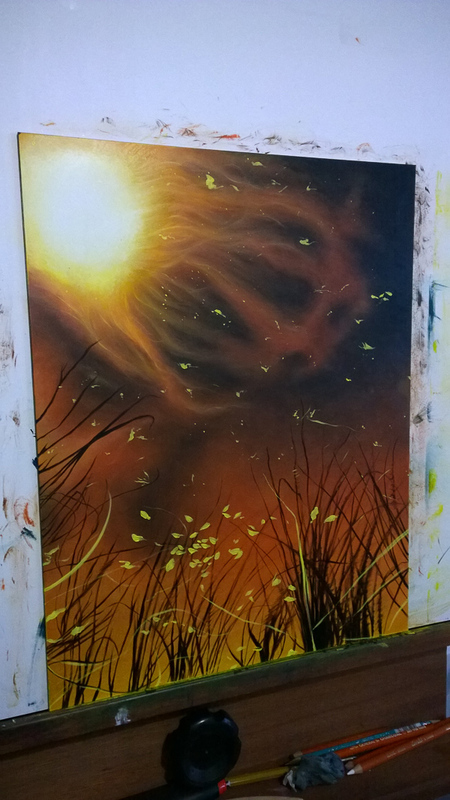 Decided to take on the sun flares again. 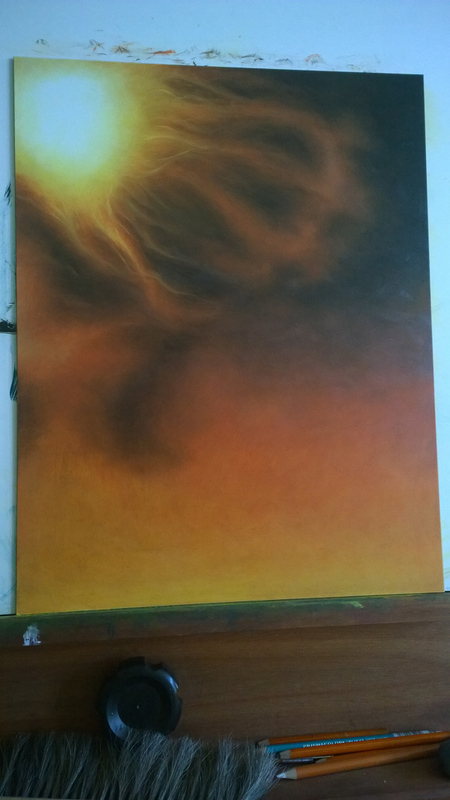 It took a bit of experimenting, such as taking a fine q-tip dipped in water, and running it firmly into the centres of the flares to bring out more of the white of the canvas, in thin streaks. Final detailing. The reeds were darkened with more black than burnt sienna, again using a round kollinsky brush, and once more swishing against them while wet to convey movement. With a bit of courage, I added on the bright yellow floating debris. The long strands had a lot of oil to carry them, whereas the flecks had very little medium; I wanted them in impasto, for a more three-dimensional, tangible effect. After this layer was dry, I went over the gold bits once more, so that they would stand out further. And then it was finished, just in time for a birthday gift. The final painting can be viewed here on the site’s gallery.